Recently I posted a frequency analysis on Rick Wicklin’s popular SAS/IML blog. Sanjay Matange also produced a nice heatmap on Rick’s blogging history using the summary data I published. Here just release the ideas and SAS codes to get data from Rick’s blog dynamically. 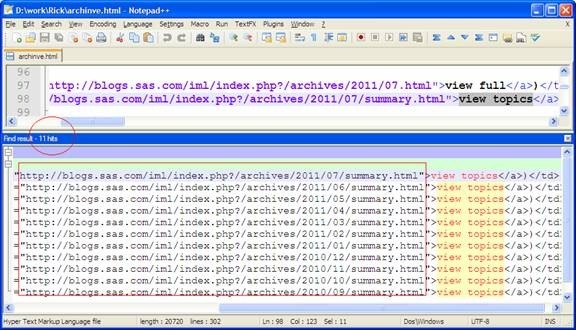 You may modify the codes slightly to obtain data from all other SAS in-house blogs (http://blogs.sas.com/index.php) since they share the same template. For other blogs, you should research the web pages accordingly to get the best suitable methods and this post can also serve as an example. For my purpose, I only need the titles and publish dates of Rick’s posts. 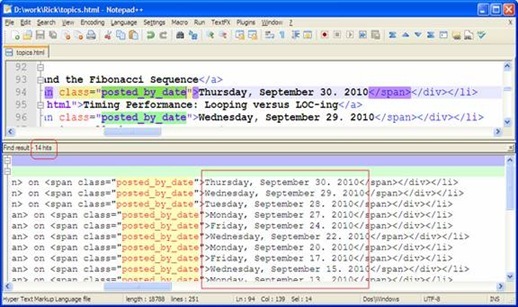 It is so called the “metadata” of the blog. I do not need all the post contents. By the way, if all information needed, you can use a blog backup tool, or write codes to retrieve all the pages of http://blogs.sas.com/iml at the maximum depth, or simply, you can write to Rick and say: hey Rick, could you please send me all the contents of your blog? And Rick may go to the management console of his own blog, export all the contents to an XML file and get back to you. This page is exactly what we want with titles and dates. Open an editor to write codes immediately to read all the information in this page?—wait. Currently this blog has posts across 11 months and you can expect the increase. 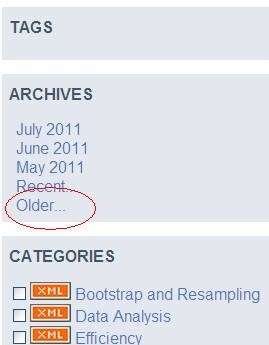 You should design a dynamic method to read all the topics pages: Sep 2010, Oct 2010, … and, today(). We are lucky. They are 11 instances of “view topics” accompanying with 11 hyperlinks for the currently 11 months’ archives of Rick’s blog. We can read such 11 hyperlinks to a macro array for dynamic retrieval. 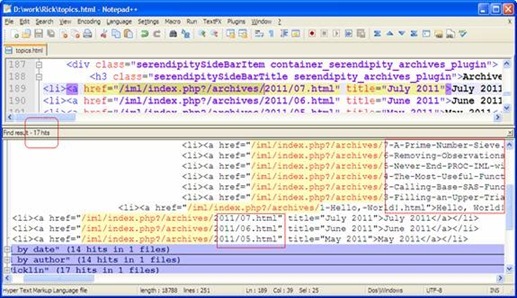 After such explorative search of HTML scripts, we can get the basic idea where can we find the interested information. Then we begin to coding work. Third step: Coding at last! For our purpose, we should first read the archive page to get all the topics links to a macro array, then read the all the topics pages dynamically. Finally, we should also add the all the calendar dates with holidays. Some friends may find that they met piece of the following codes before. Yes, such codes just assembled some skills what I learned from Art Carpenter, Richard DeVenezia, Jian Dai and lots of programmers before! It is also interesting to add additional information for further analysis, such as all calendar dates during Rick’s blogging history and holidays. [Recently I posted a frequency analysis on Rick Wicklin’s popular SAS/IML blog. Sanjay Matange also produced a nice heatmap on Rick’s blogging history using the summary data I published. Here just release the ideas and SAS codes to get data from Rick’s blog dynamically. You may modify the codes slightly to obtain data from all other SAS in-house blogs (http://blogs.sas.com/index.php) since they share the same template. For other blogs, you should research the web pages accordingly to get the best suitable methods and this post can also serve as an example. Also, the holidays and observances should manully modified according to personal working schedule. So this section serves only for demonstration.